Insurance Fraud Casebook is a one-of-a-kind collection consisting of actual cases written by fraud examiners out in the field. These cases were hand selected from hundreds of submissions and together form a comprehensive picture of the many types of insurance fraud—how they are investigated, across industries and throughout the world. Entertaining and enlightening, the cases cover every type of insurance fraud, from medical fraud to counterfeiting. 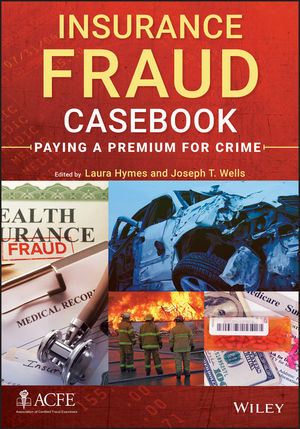 Edited by Dr. Joseph T. Wells, the founder and Chairman of the Association of Certified Fraud Examiners (ACFE), the world's leading anti-fraud organization, this book reveals the dangers of insurance fraud and the measures that can be taken to prevent it from happening in the first place. LAURA HYMES, CFE, is the Managing Editor of the ACFE's Research Department, where she oversees the editing of books, manuals and other publications related to the prevention, detection and investigation of fraud. She also collaborates with authors and speakers who are experts in the anti-fraud industry to produce high-quality educational material. She has a master's degree in publication management and years of experience in editing and publishing. Dr. JOSEPH T. WELLS, CFE, CPA, spent nearly a decade as a U.S. FBI Special Agent and is the founder and Chairman of the Association of Certified Fraud Examiners (ACFE) as well as the author of twenty-one books. For his landmark research in fraud detection and deterrence, Dr. Wells has been inducted into the American Institute of Certified Public Accountants' Business and Industry Hall of Fame and named to Accounting Today's list of the 100 most influential people for nine years in a row. He holds a doctorate in commercial science from York College, The City University of New York.